Covering a string © n with a layer of oil about a half centimeters and carry fire. Break the egg into a small ± a cup or dish. It is not advisable to do so directly on the pan © n as they can be comfortable mask bits in the preparation n. It holds water in any recipe. Once the oil is high temperature (maybe even get to smoke) to enter the egg. 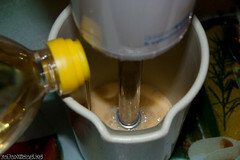 Using a slotted spoon ± ar bath oil to the egg cook top. CuÃ take much time to be cooked depends on the desired point: can be obtained with liquids or bud, let s Ndolo more time, with the only semi-yolk ³ lida. Anyway, never take more s of 3 to 5 minutes. Also © n from forming No nails (clear gold edges) if left for long periods at high temperature. Remove with a slotted spoon and add salt. No salt while they are in the string © n and that owed may cause the hot oil jump. In general it is advisable to prepare for one to be more cumbersome and s are not burned areas. For many people fried eggs are a problem because of its high cove ³ rich, trans fat and cholesterol. That’s why it’s good to know a way to prepare them to be much more healthy as s tÃ © cnica to be watching fried. It is important to have a TEFL string © n ³ n; is thanks to its nonstick surface that can be used much less oil in the preparation of a fried egg n traditional. Spray string © n with cooking spray or oil if it eats º n ± place only a small drop and distribute it with a brush or kitchen paper. Bring heat to low or moderate. Break the egg into a small ± a cup or bowl, place the skillet © ny cover with a pot lid. Thus, the heat not only get the egg from below (where is the stove), but also © n from above through the lid. It will take about 5 to 7 minutes to be ready, or more s if you want the yolk in a state s only ³ more valid. This tÃ © cnica of cocci ³ n avoids the negative consequences of a frying and allows anyway enjoy some tasty fried eggs. Remember to keep the heat moderate and that is very strong if the bottom of the egg will burn before the top is © cooked. Since the cocci ³ n of these eggs is more s slower and less oily than the traditional form, no problem with cooking for one more s simultaneously. cooking, eggs, Fried, Recipes, techniques. Bookmark.